Embedded in space and time, the oldest dateable objects concerning the city- and settlement history are shown on the first floor. Valuable canvas and historic maps complement the collection. Topics like homeland and identity, profane and spirituality reign, topography and traffic are shown. 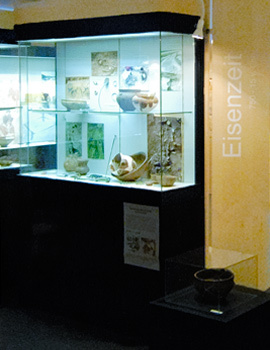 The arcaeological department of the county Dingolfing-Landau shows a documentation of the New Stone Age up to the archaeological digs of the present time. Consequently a broad past is carried up to the daylight. The objects of the later history or the city, contribute to the museum's assortment. On the second floor, the everyday life, country life, civil autonomy, religion and cult, civil habitation, social facilities, upbringing and education are shown exemplary. In the extensive basement vaults with an intersection to the "Getreidekasten" the objects of the latest past are shown. Dingolfing's way into the modern spirit, the involving mechanization of handcraft and business are documented by showing of a reconstruction of a wheat beer brewery in Dingolfing and varying handcraft objects.